Our school Sri Sri Ravishankar Vidya Mandir had organized an educational tour to Yusuf Meherally center (Panvel) for students of Std. 4-8 on 22nd February 2017. All the students gathered at the school by 7 am and left the school premises by 8 am. All the students and teachers hopped into the bus with excitement and energy. It took 1 hour 40 minutes from the school to reach the venue. As soon as Students reached there, they were served breakfast, and soon after, they all were guided towards an assembly hall and were instructed to take their respective positions and sit accordingly. Thereafter, a speaker from Yusuf Meherally came forward and gave a speech which highlighted the establishment of Yusuf Meherally Centre, struggle of Shri Yusuf Meherally, the contribution of Shri Yusuf Meherally in the independence of India and much more. Yusuf Meherally (September 23, 1903– July 2, 1950) was an Indian freedom fighter and socialist leader. He was elected Mayor of Bombay in 1942 while he was imprisoned in Yerawada Central Prison. He was the founder of the National Militia, Bombay Youth League, and the Congress Socialist Party and played a role in several peasant and trade union movements. He coined the term ‘Simon Go Back’. He coined the term “quit India” and was part of the Quit India Movement along with Mahatma Gandhi for India’s last nationwide campaign for independence from the British Empire. He was a participant of the underground movement and was in forefront of Quit India Movement. He also said “the Center is in health care, education, empowering women and Adivasis (tribal), employment generation and relief. And it has branches in Konkan (Maharashtra), Kutch (Gujarat), Nagapattinam (Tamil Nadu), Orissa, M.P. and J & K”. And he concluded his speech with a heart-rending message to love everyone and help the needy. Students first visit was to an oil garnishing industry, where oil was obtained from different items like amla, groundnut, mustard, and almond. Then they moved on to carpentry, where students got to see the skillful work of carpenters, molding and giving shapes to old furniture to give them a new look. This method of making new furniture from old furniture is better than cutting trees of wood. Students resumed their activities and proceeded towards pottery, then they headed towards the soap factory, where soaps were made from natural items like neem, jasmine and a few non-edible oils. Here also some students purchased a few of those. Further, the students proceeded towards Gandhiji’s Kuti (house) and Kasturba Gandhi’s Kuti. An armchair was placed there as a memorabilia of Gandhiji. Also, there was a very big well opposite to Gandhiji’s Kuti. Then the students moved towards soil fertility cottage where they saw ‘friends of farmers’ i.e. earthworms. From the fertility cottage, we proceeded to a small village located nearby where the tribals stay and we spent some time speaking to them. Thereafter, the students got a lunch break for an hour and this was the time when everyone met their friends and spent quality time. After lunch, students were given the time of an hour to just roam around the forest and just feel the nature. All the students went into different ways and explored the forest area and the farm area. Overall, it had been a purposeful, exciting and a wonderful educational tour which they will never forget in near future. Kids watching the pottery making and listening to the soap making session. Oil making unit and Carpentry! 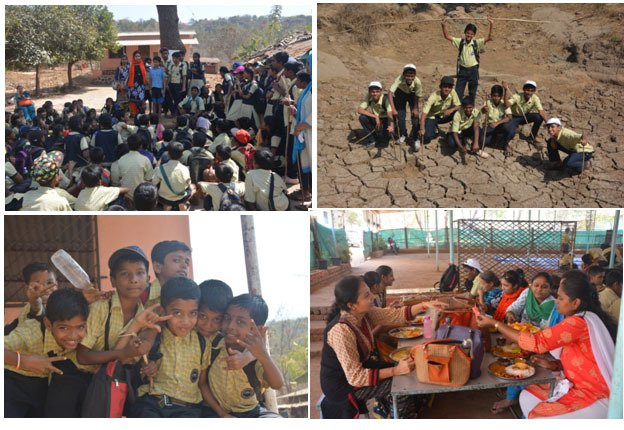 It was an amazing experience for me; children got different exposure with nature. They also came to know about making of various organic products. Also, it was a completely different environment away from the hustle and bustle of the city life. The environment there was completely calm and peaceful. Children even got to explore the forest on their own. Children also enjoyed in the bus. It was a completely different experience for them. Yusuf Meherally center was a really exciting trip. We were very close to our nature. I saw the way they do vermiculture, organic products etc. kids when they get the direct exposure they were really happy. The environment was full of green and even the forest seemed to be mysterious. Kids got the opportunity to explore it alone. They had mouth-watering lunch served, not only their stomach even their heart was full. Indeed, it was a great experience. Such trip is essential for the mental growth of the children. It was a different and a joyful experience for both the teachers and students. It was completely different from their everyday mundane and monotonous life. They also got the direct exposure as in how various organic products are manufactured. It was a break from the fast city life, peace, and serenity everywhere. The student made to explore the forest alone; they also had a great time with their respective teachers and students in the bus. Hope, more such trips will be arranged for kids.